At Conid we use the high-quality nibs from Peter Bock. Since we strive to deliver the best possible nibs, we choose to fine-tune each and every nib that leaves our premises. Furthermore, each nib is accompanied by a certificate which guarantees that the nib writes as requested. When no specific request has been added, we will provide the nibs with a good, generous flow without being too wet or dry. These parameters can be slightly affected by the use of different inks or paper but those variations should be minimal. Writing pressure is also a factor to be taken into account. We certify our nibs with a rather light writing pressure because that is when the tines will not, or at least not much, spread and change the line thickness. Conid offers only the standard Fine, Medium and Broad nibs from Peter Bock. Since both Bock and Conid are European manufacturers, we use Western line widths. This means that the written line of a Fine nib will be approximately 0,4 mm.The Medium will be approximately 0,5 mm and the Broad nibs will be closer to 0,7 mm. Eastern or Japanese line widths are usually about 0,1 mm smaller than their European counterparts. At Conid we will always talk about the written line width as this is the only way to offer a clear representation of how thick a line will be. Some manufacturers talk about the width of the tipping itself which means the written line will eventually come out quite a bit smaller. This is due to the fact that the tipping is rounded and does not touch the paper with its full diameter. With exception to the size 8 nib, all nib sizes are available in Stainless Steel, Titanium or Gold. The size 8 nibs are only available in Titanium and Gold. Each material has its own characteristics. Following explanation features our nibs in their standard, non-ground state. Grinding may alter the writing experience, especially in the case of an Italic grind. Read more about grinding below. This sturdy and corrosion resistant steel has quite a stiff nature. This means that it allows very little flexibility. A stainless steel nib is therefore a very good companion when taking notes very quickly or when you have a heavy hand. The line variation will be minimal when pressure is applied. On the other hand, this nib is not suitable for creating your own line variation by applying pressure. 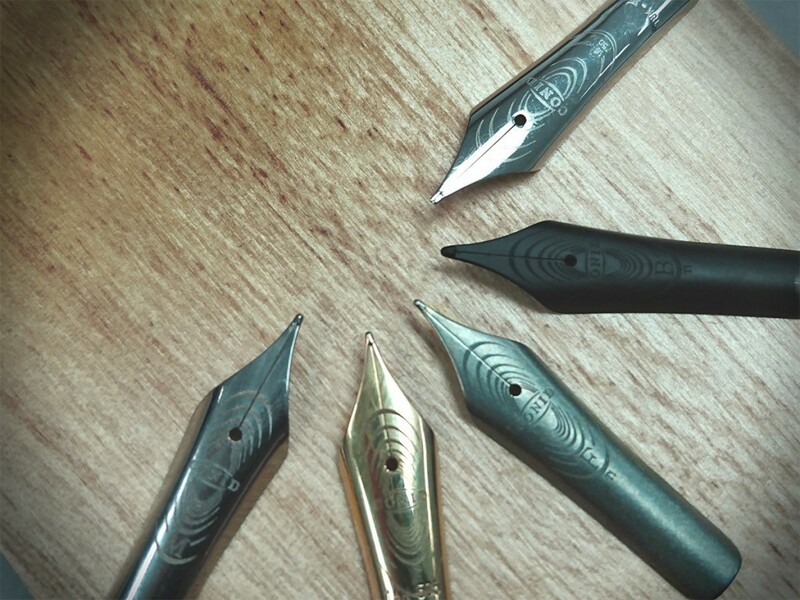 We like to recommend these “nails” to people who just got started in the fountain pen world to get acquainted with the ins and outs of writing with a fountain pen. A rather exotic nib material since not so many nib manufacturers dare to use it. Most nibs made out of Titanium will have a rather high flexibility, without it being a true flex nib. Titanium offers a great line variation but requires a delicate touch to avoid spreading the tines too much. However, our own experience taught us that not all Titanium nibs are equally flexible. We believe that this might have to do with the size of the nib, specific grade and the manufacturing process. This flexibility makes Titanium the perfect material for basic calligraphy without having to use a ground nib or even specialist calligraphy nibs. Although a very luxurious material, gold is known to be one of the best choices in nib material. Gold is not only known for its good feedback, flexibility and springiness but it is also an exceptionally long-lasting material. Golden nibs will not suffer any (or at least very little) decay or corrosion over the years, or even decades.